It’s no fun when your kids are sick. You want to do everything in your power to make them feel better. But the fact is that in most instances the only thing that’s going to help is medicine. We know … children and medicine are not the best of friends. We’ve all heard horror stories of parents having to plead and cajole their kids into taking a spoonful of something. Some of us have even starred in them. While we may applaud your efforts and laugh at your expense, we want you to know you don’t have to torture yourself. The best thing about a compound pharmacy is the ability to customize medication for individual patients. What does that mean to a mom who’s ready to fold a bitter-tasting antibiotic into a scoop of ice cream? We make kid-approved flavored medicine! From cherry flavored prescription gummies to bubblegum flavored medicinal lollipops, we can create something your child will be willing to take. 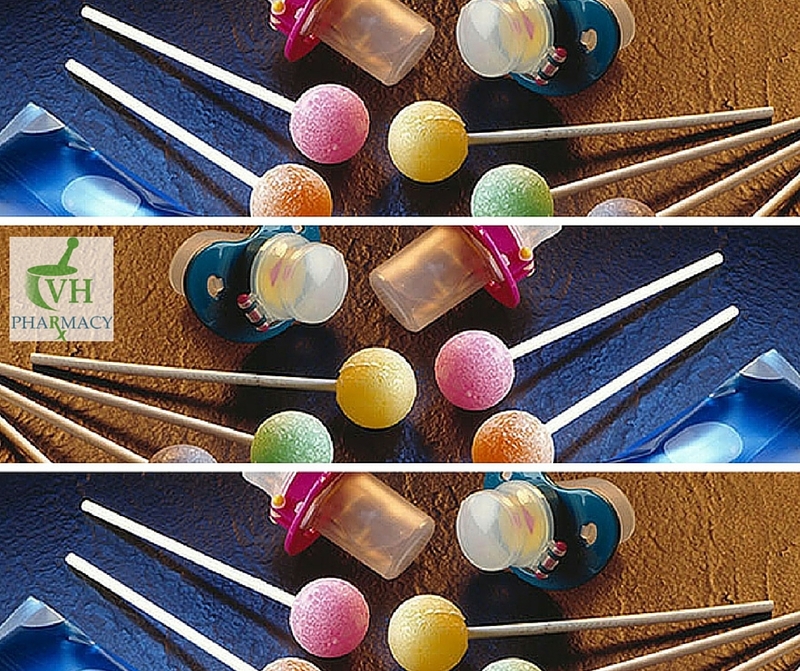 In fact, a compounding pharmacist, in conjunction with your child’s pediatrician, can prepare medications in a rainbow of fruit flavors and multiple alternate forms, including: dissolvable tablets, lollipops, gummy treats, and effervescent drinks. For some kids, it’s not just about the taste. More and more children are being diagnosed with allergies and sensitivities to certain additives found in conventional medicine. Compounded medication can be made without things such as dyes, lactose and alcohol. If your children’s medication could be administered in candy-like shapes, tastes and forms, then they’d stop fighting you about taking it, you could stop worrying about that, and start worrying about something else – like homework. ABOUT VH PHARMACY: VH Pharmacy is a family-owned and operated neighborhood pharmacy. In business for more than 40 years, VH Pharmacy has been under the leadership of Pharmacist Eddy Blanco for the past 11 years. With his extensive knowledge of pharmaceutical compounding, Eddy Blanco has transformed VH Pharmacy into a technologically cutting-edge facility. To learn more about our services, please visit our website at www.vhpharmacyrx.com or call us today at 305.324.8777.